Cooled, grilled corn on the cob and juicy cherry tomatoes give this Tuscan-style salad a summery appeal—no matter when you serve it! 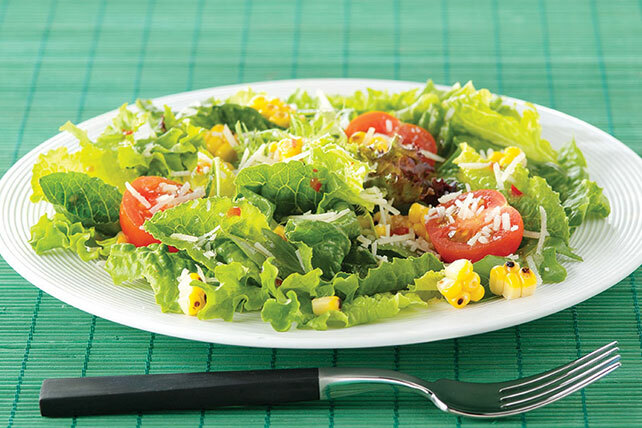 Toss greens with corn and tomatoes in large bowl. Preheat grill to medium-high heat. Remove husks and silks from corn. Place corn on grate of grill. Cook 3 min. on each side or until corn is lightly browned on all sides, turning frequently. Firmly hold cooled ear of corn at an angle with smaller end of corn on work surface. Carefully cut down the ear with sharp knife, removing several rows of kernels at a time.